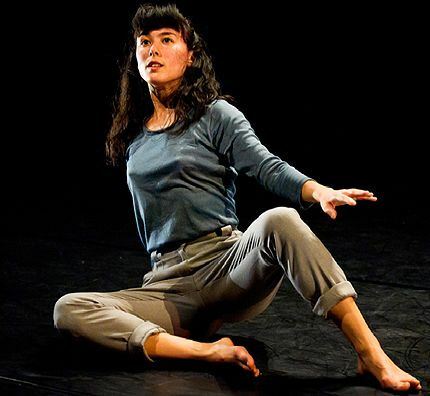 Aretha Aoki’s Las Gravitas, a solo about making a solo, ran last weekend at Danspace Project, in a shared evening with Benjamin Kimitch who presented a duet between Julie McMillan and Claire Westby titled discontinuous sounds (his debut evening-length work). McMillan and Westby begin perched on releve, repeatedly adjusting their stances in unison by tiny increments before bursting open into swirling, airborne phrases punctuated by long periods of stationary posing. The work often appears to echo Kimitch’s early training in Chinese folk dance, with his extremely composed dancers cycling through sculptural postures with precise head carriage and delicate hands, sometimes at a glacial pace and sometimes rapidly. They move through a series of ten poses in seconds right before eating up full minutes sinking to the ground or letting their hands fall from their throats. Temporality seems to be his major interest here, with extremes in timing becoming more pronounced towards the end. The work is austere and dignified, if not especially resonant. Aoki’s choreography is deceptively simple- the language feels yogic at times. It is largely linear and circular, walking in spirals, lunging with outstretched arms, long diagonal pathways, pausing in standing postures. She interrupts this straightforward openness with animalistic crawling, pawing the ground and rolling her spine, and self-consciously turning inward and hiding her face during collapsed floor sequences. Her phrases are far from overwrought and her dancing is both precise and casual. She is an endearingly earnest presence, but there is a sense of risk and disorientation; her head swings just past a rapidly rising knee, her feet scuff across the floor as limbs shoot out and her upper body buckles off-kilter. She frequently resembles a tilted helicopter until she mellows again into spiral walking and vertical stillness. She is accompanied only by a low, droning sound score until Peterson’s voice interrupts her third pass through the phrase. She talks about Aoki’s interest in “presence and erasure,” “outward versus inward” focus, and accuses her of “boring us into oblivion.” She starts off providing a narration of our experience watching Aoki move through her world, giving us a lens through which to see her and and informing us of her investigative questions. Her tone quickly becomes didactic, diagnostic (“she’s showing off flexibility she just doesn’t have. Better go back to yoga class, Aretha”) and sarcastic (“a 15 minute solo? Who does she think she is, the next Deborah Hay? !”), and the lights go down on a spent Aoki, having completed three complete repetitions of her dance. Footage of an icy blue orb is projected onto the back wall, and Aoki reemerges in a formal and fluffy white blouse to repeat in slow-motion a one-armed salute while walking backwards from the image. Still facing the now-fading projection, she desperately flaps her arms backwards like a distressed bird, bows deeply, pivots, and picks up a microphone to make a “confession:” she guiltily claims to have choreographed the dance yesterday, though she’s “been thinking about it for a really long time.” She starts fake-crying, and melodramatically lists off excuses for her procrastination (she’s just been really busy, her apartment is being exterminated, etc.) before excitedly reciting various fun facts: did you know that gorillas play tag? That 90% of our cells aren’t human but bacteria? That the Voyager I photographed Neptune in 1977 and is now at the edge of our galaxy, in the “stagnation layer,” not out and not in? The content of her monologue and the range of subject matter from personal/inconsequential to cosmic/grandiose is perhaps the most explicit of several versions of what Aoki and her collaborators are interested in: a performance that expands outward and contracts inward simultaneously. We do feel these opposing forces, and I still find myself wondering about the in between- is that when character and narrative are so strongly felt? When we witness her shifting from mundane to immense and from abstract to real-life? Despite all of the layers and moving parts, as a spectator to this work it is impossible to divorce dance from dancer. Aoki’s experience is constantly at the center and her presence is the most felt. However, Las Gravitas is a rare solo that feels personal to her body and aesthetic interest but also reaches beyond the soloist. It feels here like she is trying in earnest to comunicate rather than obscure some essential significance, and it is satisfying to watch that effort play out even if we are unsure of her findings. All in all, the work feels like a substantial achievement.